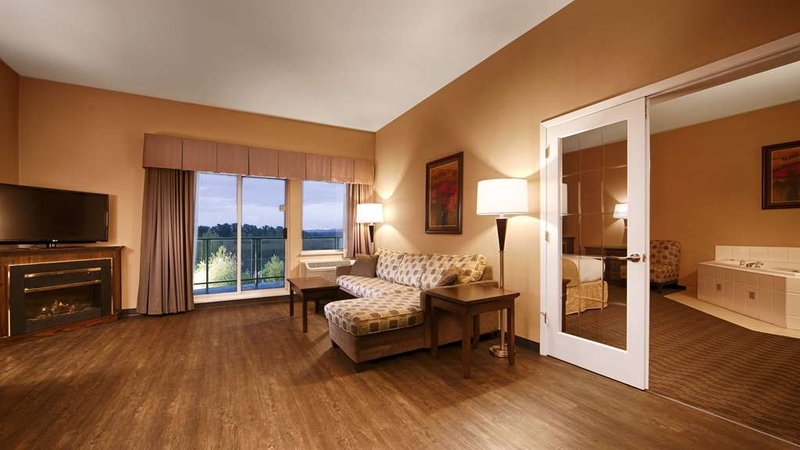 El Best Western Plus Mission City Lodge se encuentra en el centro de Mission. Venga y disfrute de las mejores atracciónes turísticas cerca de nuestro hotel. Precios bajos garantizados y ofertas exclusivas. El Best Western Plus Mission City Lodge es el hotel de servicio completo de mayor tamaño de Mission y ofrece unas amplias habitaciones, desayuno completo gratuito y mucho más. Nuestro hotel goza de una magnífica ubicación en Columbia Británica, a sólo unos minutos de la frontera estadounidense en Sumas, Washington. Los huéspedes del hotel podrán disfrutar de fantásticas vistas del Mount Baker y magnífica pesca en el río, visitar la Abadía de Westminster, un monasterio benedictino en activo, o el parque patrimonial del río Fraser con sus grandiosas vistas de Mount Baker. Los visitantes de viaje en Mission, Columbia Británica, también podrán pasar magníficos momentos de diversión en el circuito de carreras Mission Raceway Park y apreciarán la gran variedad de restaurantes de las proximidades. Un breve recorrido a pie le llevará a la fábrica de cerveza Mission Springs, donde podrá degustar una exquisita comida y los distintos tipos de cerveza de fabricación local. Las habitaciones y suites están hermosamente decoradas para que el alojamiento sea cómodo y agradable durante el viaje. Todas las habitaciones de nuestro hotel están equipadas con microondas, nevera, cafetera o tetera y secador de pelo. Para su mayor comodidad, el Best Western Plus® Mission City Lodge ofrece un centro deportivo, acceso gratuito a Internet de alta velocidad en todas las habitaciones, tanto inalámbrico como con cable, piscina cubierta y balneario. Tanto si va a dar un paseo por el mercado de granjeros de Mission el sábado por la mañana como si va a explorar la historia de la zona en el museo cercano, nuestro personal cordial está preparado para garantizar una estancia inolvidable. Alójese en un entorno rural con todas las ventajas que ofrece esta histórica localidady a sólo una hora y diez minutos del centro de Vancouver mediante el tren de alta velocidad de la Costa Oeste. Fácil acceso al aeropuerto de Vancouver gracias al nuevo servicio de transporte CANADA LINE LINK. Haga su reserva en línea hoy mismo en el Best Western Plus Mission City Lodge de Mission, Columbia Británica. "I would stay here again for my next business travel." My business team stayed here 1 night (Apr 18, 2019). The staff was courteous and informative. The rooms (which all have microwaves and small fridges with freezing sections) were clean, spacious and comfortable. There were plenty of sturdy surface areas (desk, coffee table) to unpack our luggage. The food at the hotel restaurant was excellent. The lamb was "melt off the bone tender" and delicious - my compliments to the chef! I would stay here again. "Good bang for your buck!" Check in was easy, front desk help was great, restaurant was very good quality at a good price, morning breakfast was good with lots of help from the workers. Was easy to find and get to, room was very clean and comfortable. The front desk staff are very accommodating and kind. 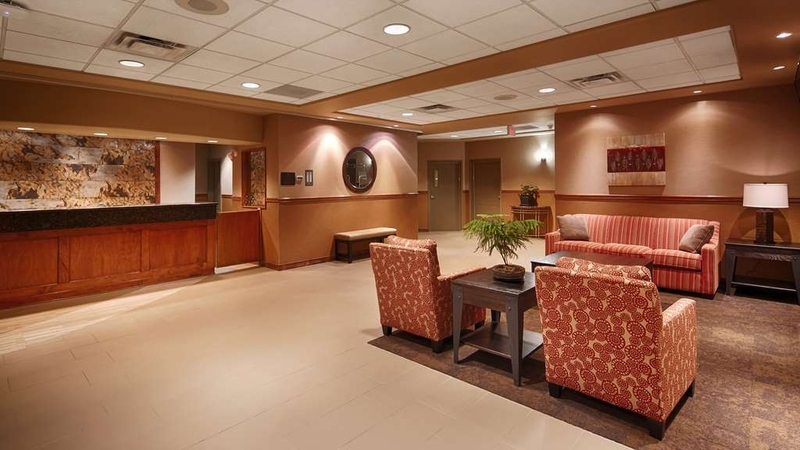 They are quick with check-in and attentive to your needs during your stay. I had a lovely experience thanks to them! Clean hotel otherwise with a great little pool and hot tub. 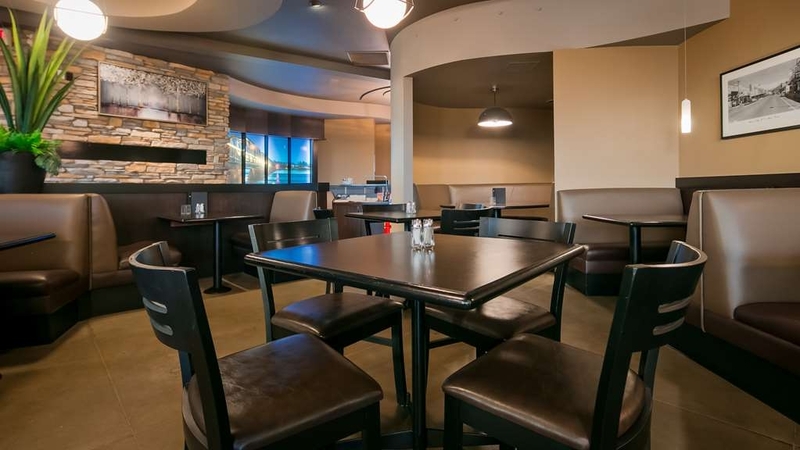 From the well-appointed rooms to the very friendly staff the Best Western Plus Mission Lodge is a great place to stay when you're in Mission. 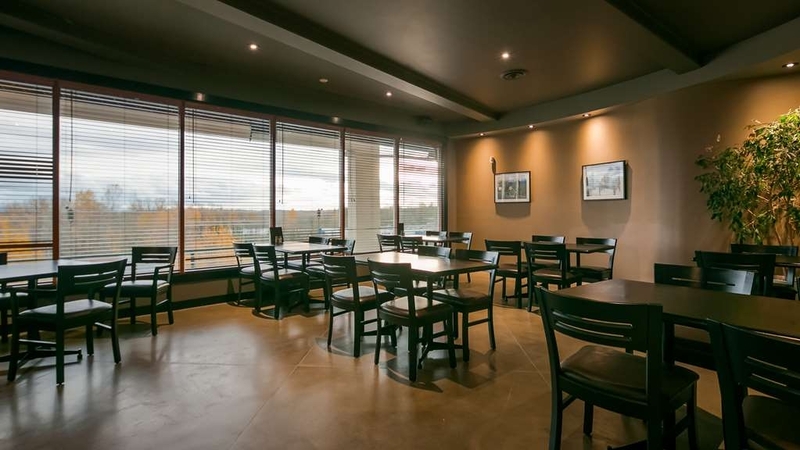 It is close to everything in Mission and Abbotsford Panther restaurant it is second to none as far as restaurants in hotels go. 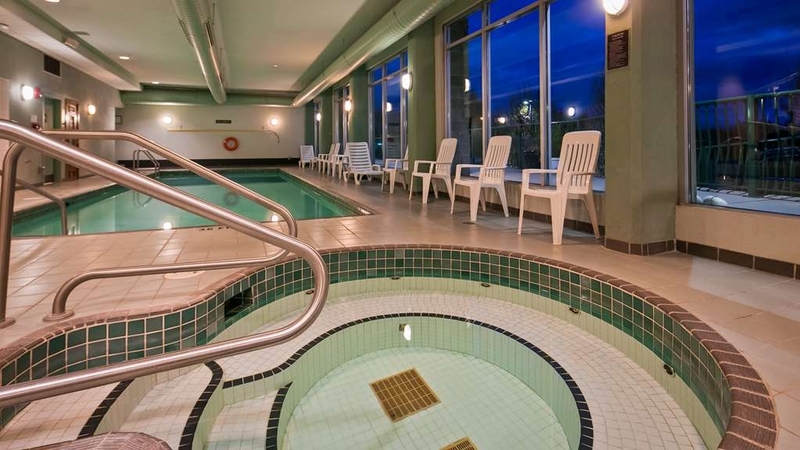 They have an excellent Fitness room which is very well-appointed and their hot tub and pool are pretty darn good too. 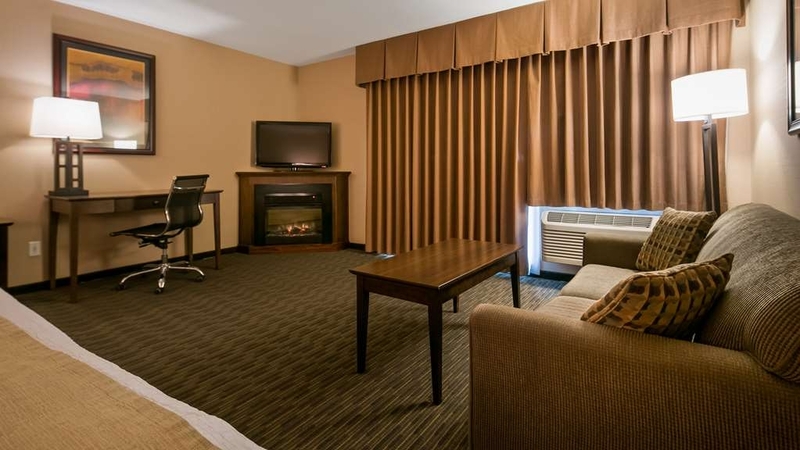 the next time I am here on business I will definitely stay at the Best Western Plus in Mission. This hotel is nothing fancy, but it is clean, and staff are great. Suggest asking for a room at the back of the hotel, as the front faces the road and can be quite noisy because of traffic. Continental breakfast is great. The stay was okay for the most part, with the exception of the traffic noise that builds up from about 4:30 am on. I would highly recommend making sure your room is booked on the opposite side of the hotel if you don't want to be able to sleep in. We arrived at our Best Western Hotel after 9 PM tired and ready for some R & R and it came to us immediately upon checking in. The woman we first me was a breath of fresh air. She was a perfect fit to our perfect stay. We stay here often while visiting family. Staff is always friendly and helpful, and we always enjoy our visit.Having a hot breakfast is nice, with decent coffee. Warning that the coffee system has switched to kuerig. I stayed there only one night, pretty much just to sleep, prices are good for what you get. I was expecting something dirty and smelly but it wasn't. Seemed very clean and staff in front desk were very nice. If I have to stay in Mission again I would definitely stay at that hotel again. Hotel is clean and staff is friendly. Room was large and comfortable. Breakfast is terrific! Grab and go as well. But if you are annoyed by the sound of trains you kinda hear them a lot. Lots of parking and when you check in you should find out where your room is so you can drive to it and take your luggage in nearby. "Another great stay at the Best Western in Mission"
I dig this hotel. Very friendly front desk staff - and helpful. Great rooms. The restaurant hosted an event for us last year and the food was amazing. The pool is nice. Handy to Mission, Abbotsford, Maple Ridge - which is great for my work. I want to especially thank employee James for his assistance when I checked out very early in the morning. He was kind and went out of his way to help me although his job description wasn't guest services per se. This is the kind of gesture that means more for customer loyalty than just a comfortable bed or free continental breakfast. Thank you James! "Stay there after our wedding"
Amazing view Fraser River view, Clean and quite. Good restaurant and Starbucks right across the street. Walking distance to shopping district. Easy to find and a spacious parking lot. They had a nice pool too; but I didn't get a chance to go swimming. 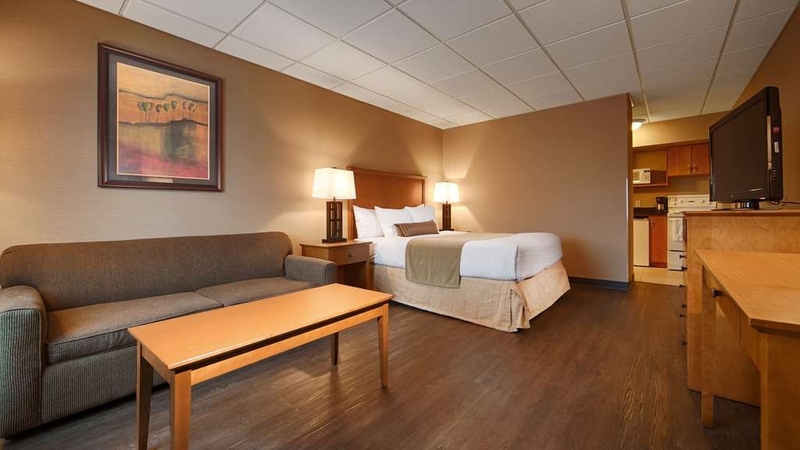 "Great quality at good price"
This hotel is clean and fairly updated. The view from my room was amazing, and the front desk agent was efficient and friendly. I needed a bigger room and she was able to accommodate me without issue. My son and I really enjoyed the pool, it was bigger than most hotel pools. Good hotel at a reasonable rate. Three of us checked in for three nights while Sturgeon and Salmon Fishing out of Mission. The rooms were clean and comfortable. Good sized rooms. All amenities were in place. Staff was great and easy going. The associated restaurant was good but a bit on the upscale side which should not detract from this rating. A special thank you goes to the breakfast staff. As we were heading out on the river for a days fishing, we were pleased to find pancakes, eggs and sausage, plus all the other breakfast items. The coffee was hot and enough that we could fill our thermos. The staff was really friendly and made us feel right to home. They even opened up a bit early so the crowd of fishers that gathered at the door could get a earlier start. Thanks guys. The room was very good and spacey. The level of service was very good indeed. There is an associated restaurant but locals do not rate it. We found it okay but ate more at Mission Springs by Walmart - which is favoured by locals due to price and very large portions. There is a free beakfast which is run by exceptional staff who will do everything to help. The breakfast is basic but who cares when the staff are this good. We booked the honeymoon suite for our wedding weekend. 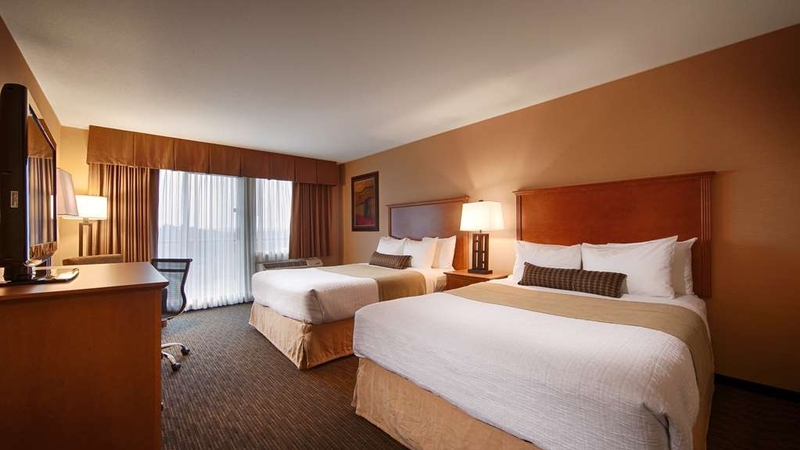 The room was very clean and a good size, the staff were all very kind and helpful. Our out of town guests loved staying all in one place together. Generally I enjoy staying at Best Western hotels and this one was a VERY NICE surprise. The spacious clean rooms, Great value for the money, Great restaurant and pub and a very good breakfast included. All the staff were very smiley and helpful. We would gladly stay here again. Have stayed there numerous times. Every time was a great experience. The staff went out of their way to accomodate my husband and I. It is so close to Mission Raceway Track and so easy to access. Wal-mart and Superstore close by. "Clean and convenient for a good price "
Spent 3 nights here. Rooms were clean, comfortable and clean. The pool and hot tub was a nice bonus. 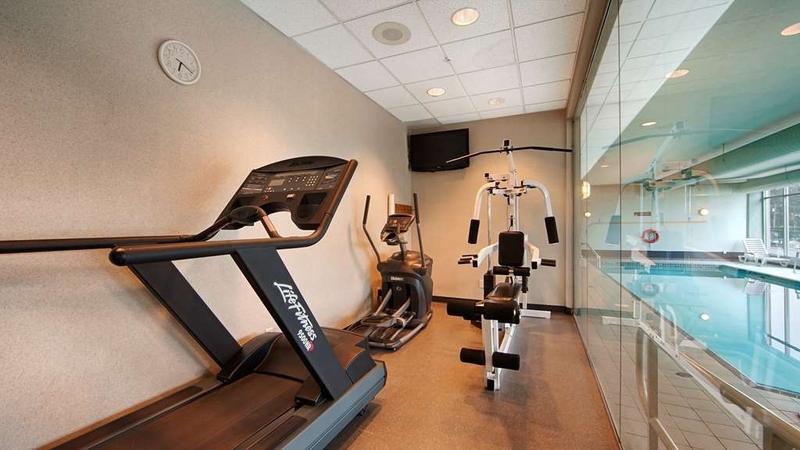 There is also a decent exercise room and restaurant in the hotel. The hotel is close to many amenities. We will stay here again if we're back in the area. "Never stay here again! Worst service!!!" This was the worst front desk staff I've ever experienced. I booked a room 8 months in advance. We requested early check-in (between noon and 2pm) as we were attending a wedding at 4pm. Received confirmation for early check-in. When we arrived we were told we couldn't have the room until 3pm. This didn't work for us as a shuttle was scheduled to pick us up at 3pm. We were given a choice to check in at 3pm or she could open the pool washroom and we could change for the wedding in there. Then on the day of check out the elevator wasn't working and we had to carry our luggage down 4 flights of stairs and my wife has a bad knee. We found out later that there was a service elevator that they could have offered us but didn't. Hello Sue, I apologize that you were not able to check in early along with the rest of your wedding party. Although we try our best to accommodate every guest who requests early check ins, there will be instances when we will not be able to do so. Our stated check in time is at 3pm and our check out time is at 11am. Depending on occupancy and the times guests check out, we sometimes are not able to allow an early check in if the rooms are not ready. 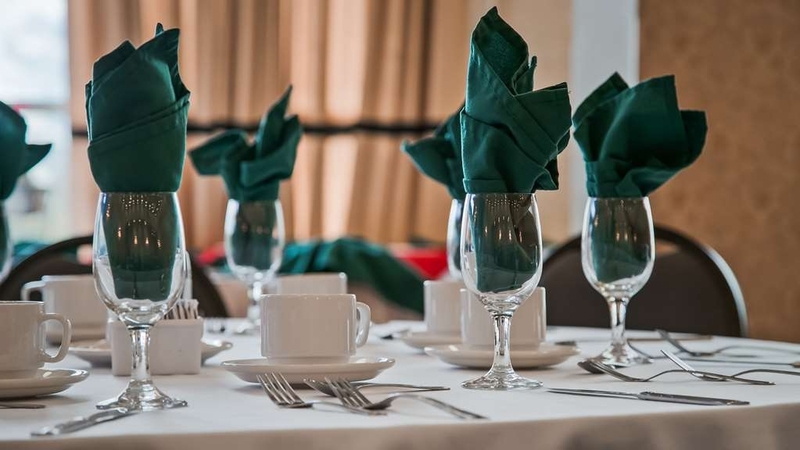 We understand that with wedding times being an issue, we always try to move rooms around to accommodate the request or advise that early check in is not guaranteed. However, we did manage to get many of the wedding party checked in early. Its unfortunate that we are not able to do it for the entire wedding party. I also apologize for the elevator being out of order. As with most things, it would happen during the weekend. We requested an emergency repair person to look into the elevator, and had it up and running again by mid morning before most guests were checking out. Our third floor is also on the ground level from the rear parking lot, and we would have been happy to help carry luggage for you. Best regards, and hope you had a great time at the wedding nonetheless . Clean room Clean bathroom Free parking Free breakfast, and very good one, surprised with variety and quality of continental breakfast. The lady who runs breakfast very diligent. It's not Hilton, but if you are in town it's a good place to stay. Not much restaurants in mission, and did not try the hotel restaurant. Overall, recommended. "Clean,comfortable no frills right for price"
I spent a night with my son on a fishing trip. The check in and out were a breeze, and receptionist was helpful. Room was big enough with everything clean and in good order. The included breakfast was good with decent options. Despite the hotel being on a highway I was pleasantly surprised by the lack of noise. I will be staying again here for future fishing trips. "Good stay but spammed afterwards"
I had a good stay here last week but even though I completed a full review/survey that they sent me a few days later, they have spammed me again with a reminder to complete it. I'm finding I get spammed by most hotels with such requests and am now leaving "average" reviews when it happens. Another negative feature shared by other hotels is that although they display messages saying that we can help the environment by leaving our towels hanging on racks or hooks, and re-using them the next day, the towels were washed regardless. It was a bit pricey but was otherwise a good place to stay. A great experience with BW. I will start with the brilliant experience, the stuff ere is so friendly. very quite place, good for kids as the Swimming pool is a kids friendly. I will defiantly come back here soon! We have stayed at this hotel many times, but this time was very disappointing. We checked into the hotel which was very quick, went to our room only to find the floor had not been cleaned, rug was covered in pieces of dirt, there was coffee spilt on the tiles a couple of dried up what looked like blueberries in the corner by the door and pieces of toilet paper on said floor. Other than that the room was clean. I let front desk know and they fixed the problem right away. Another thing was the internet was very slow if at all. Had key problems as well. For the price that rooms cost I think they should have glass mugs and glasses. They staff was very friendly and great service. Great place easy access to shopping and facilities we wanted. We were there for the dance recital and they were so helpful with all the girls needs. 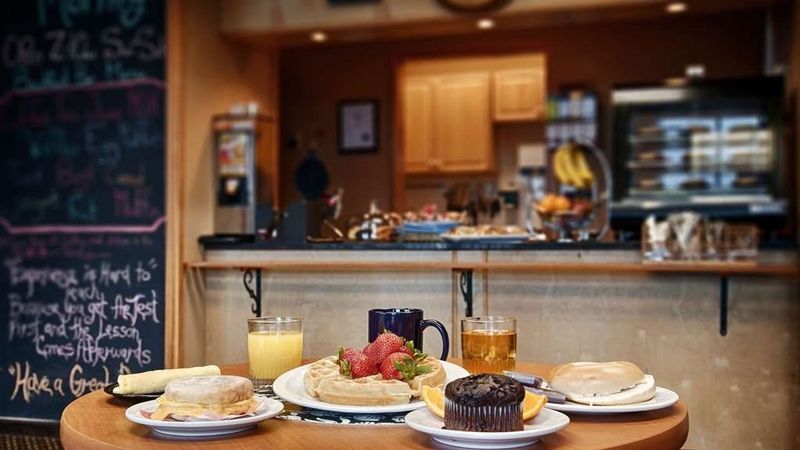 The continental breakfast is so good, lots of selection for even the pickiest eaters. Great place to stay. Excellent service and amenities. Close to everything and friendly staff! Rooms are clean and comfy - internet was great and the pool was beautiful. Easy to access and rates were good as well. Plenty of parking! "Clean, great price, location and extremely friendly staff." The rooms were very nice and clean. Staff were extremely friendly. Highway truck traffic a little annoying. Front Counter did move us from 2nd floor to 4th. It did make a difference. Very accommodating. The breakfast was OK but only went once. I would still recommend this hotel. Front Counter and cleaning staff very nice. My family enjoyed our stay at the Mission location very much. The room was clean , the kids were very happy with the pool and swam once sometimes twice a day during our 4 night stay. The breakfast was delicious, I loved the waffles! I stay here every time I visit Mission, BC. The staff are helpful, courteous & friendly. They will assist in finding a discount rate if one is possible. The room is functional; clean and the coffee is so good. Love the Keurig machine. The onsite laundry facilities are well-kept and machines clean. Very handy for those of us staying extended periods unexpectedly. Machines not too expensive either. Enjoyed continental breakfast; great selection of pastries & cereals, etc. Highly recommend this place. The room was clean minus the huge spider in the shower and the gross mass of hair under the sink on the floor... The bathroom was far from clean. We called and complained to front desk but there was nothing they would be or could do about it, as we didn't realise until hours after we had checked in. We literally checked in dropped our bags off and were gone again. So there was not much time to notice anything until we got back to our room.. The location is good with fitness equipment. The rooms are clean and spacious. Breakfast was quite good and is included in the rate. There are nearby restaurants and a Starbucks next door. The reception staff could do with some customer service training but this didn't interfere with the basics of the room and stay. I read some of the poor reviews before I stayed here, and of course it had me concerned. However, my experience was very much the opposite. 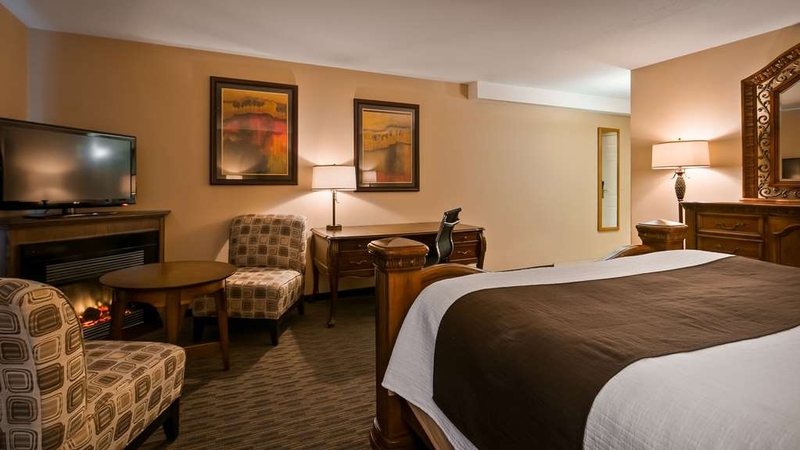 Rooms were clean, staff was always friendly and smiled and the continental breakfast met my expectations. I left satisfied and will add this hotel to my list of places to stay. Staff were pleasant, restaurant has been restaffed recently and boasts a new menu, menu. A little slow from the kitchen, wait staff were pleasant and attentive. Constructive feedback was welcomed. Rooms were comfortable and quiet for us. Right on the Highway which is noisy and busy. If your room faces the higway open your window and hear the roar all day long. Room was standard.Good size and clean.Nice size bathroom and good shower pressure. Service was allright I would not make it a destination but if driving by and needed a place to sleep it's ok. Breakfast included was reasonable. I arrived late in the evening on Sunday, January 20 after a VERY long day of travelling. My gps took me to the back of the hotel which had a secure entrance that only allowed access to registered guests. So I re-loaded my luggage, climbed back into the car, drove around to the front, and made my way inside. I entered the front lobby to find that a security cage had been extended about 7/8 across the front of the desk. The gentleman working the desk asked me through the cage if he could help me. I told him that I had a reservation and asked if I could approach the desk. He said that I wasn't allowed to approach the desk until he checked my ID. I know that I was a weary traveller but I didn't think that I looked that disheveled that I appeared to be some kind of risk, especially since I was carting 3 bags along with me. Once he checked my ID I was allowed to approach the desk. Typically when I enter an establishment such as this I receive a feeling of being welcome. In this case, I felt somewhat insulted and judged. I never went past the front desk again despite staying for 3 nights. I used the back door exclusively. Other than that, I really enjoyed my stay. My room was fairly clean and comfortable. Only issue was finding someone else's toenail on the carpet. The floor was otherwise clean and I'm sure the vacuum just didn't pick it up. Not a huge deal in my books. 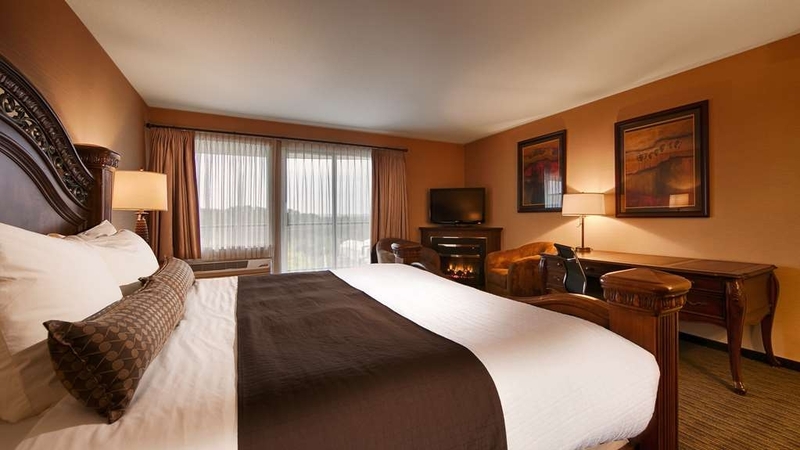 The hotel is conveniently located on Highway 7, Its quiet,its comfortable and the staff manager was fantastic. 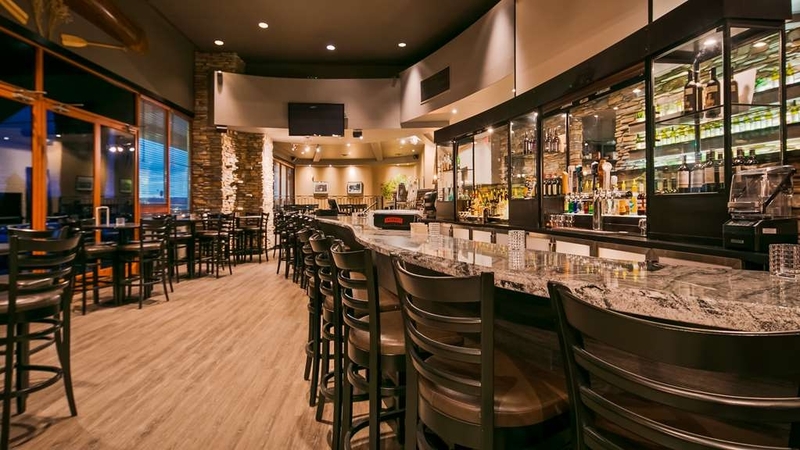 The restaurant bar is nice, has good food, and you don't have to leave the hotel. We were without power for 2 days, so the hotel was close by for us, and it was nice to relax and get warm in a nice room. Great stay at this hotel. It is definitely older but very clean. There is no breakfast included but there is a great restaurant in the hotel. It has a pool and great parking. Very friendly staff - it is by the hospital so it is just a 2 min walk. "Nice hotel and good staff but noisy"
We stayed on a weekend when there were a number of Christmas events being held at the hotel. People were lingering in the hallways talking at 2:00am, the noise outside our room meant that I had to get out of bed and tell them to take their conversation into a room. The people in the room above us were stomping around until well after 3:00am. The noise from their footsteps carried down to our room which meant we didn't get much sleep. The room was big and nicely set up. The staff were very helpful and I think they were genuinely sorry to hear about the noise problems impacting our room. They went out of their way to try to address the issue in the morning but it was still a sleepless night. The location was perfect for my business needs. "Nice hotel, no hot water"
I liked the hotel but not being able to take a shower was totally unacceptable. (We were told when we arrived there was no hot water). Ok I got to take one the morning we were leaving but I really wanted one the night we arrived. For that matter we had no water at all for the first few hours so we couldn't even wash our hands or even go to the bathroom. I suppose that doesn't happen very often there but still it happened to me. That was a first! The location was very good, and rooms were clean and comfortable. The breakfast staff could have been more welcoming and tried to rush us out because we came towards the end, but mostly we had to wait for the waffle iron due to a line up and they were constantly trying to put stuff away. 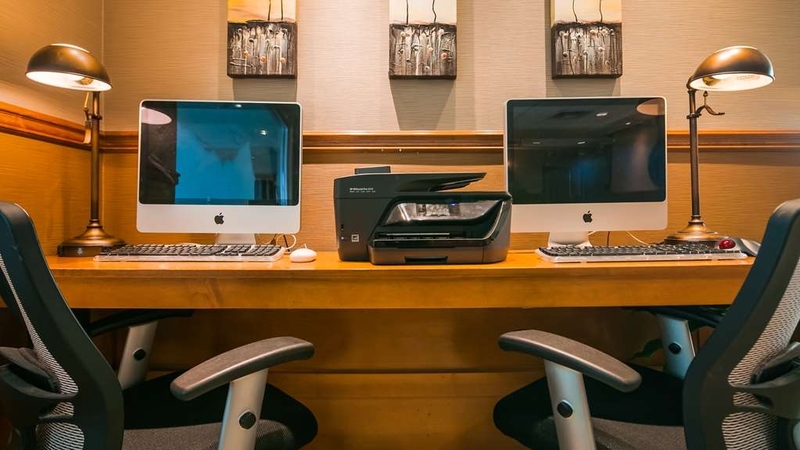 "Terrible experience with very unprofessional and no personality front desk staff (Cheryl) on check out"
Front Desk staff (Cheryl) was very unprofessional and needs to be trained on how to speak to customers particularly a loyal customer (myself being a platinum member). I originally booked for one night but business needed me to stay longer. Thus, I asked that my stay be extended for 3 more nights. The night I asked for an extension of stay, I asked if it is possible because if it is not, I don't mind moving to another BW Plus in Abbotsford. However, Pam at the Desk informed me that there's no problem at all and she extended my stay. Let me re-iterate, I asked for 3 more nights. Thus, 4 nights in total. On my last day, while I was away from my room, I received a call from Cheryl, informing me that I should be checking out already. I was surprised and told her that my booking is until Sunday night, so my check out is for Monday morning. She insisted that I should check out already and that they needed my room type for another guest. In a threatening voice she was yelling at me on the phone, telling me that my booking is only up to Sat night, check out Sunday. I was appalled by her approach over the phone (very mean and arrogant) and when I told her that, it looks like FD made a mistake in their system for the number of nights that I asked for, she never apologize and rather replied with "So, what do you want me to do now? "—repeatedly and in a very arrogant tone. She also threatened me that she will ask housekeeping to pack all my belongings from the room and take it away, if I don't check out. How in the world can you say that to a good paying and loyal guest? Very unacceptable! Terrible! Mind you, I was away on a business meeting when she called me. Now, that was very upsetting and I told her that she can't do that. I asked to speak to the manager only to be told that he's not available. I was frustrated and very upset. The entire conversation stressed me out unnecessarily. Her manner of speaking is unbelievable, very unprofessional and unkind. I've never had this very bad experience in any BW hotel and I'll never forget how I was treated here. Quite traumatizing! On another issue, the room was quite dusty. In fact, there was a thread of dust hanging on the light fixture in the bathroom (gross). I asked for housekeeping. It was removed but not completely and obviously, housekeeping did not really clean the room properly (see photos). It was also noisy with kids running back and forth the hallway. On a positive note, the ladies (specially Judy) at the breakfast room were very pleasant, friendly and accommodating. Basic breakfast food selection but good enough. Summing it up, bad experience in this hotel and never coming back. There are other hotels nearby. 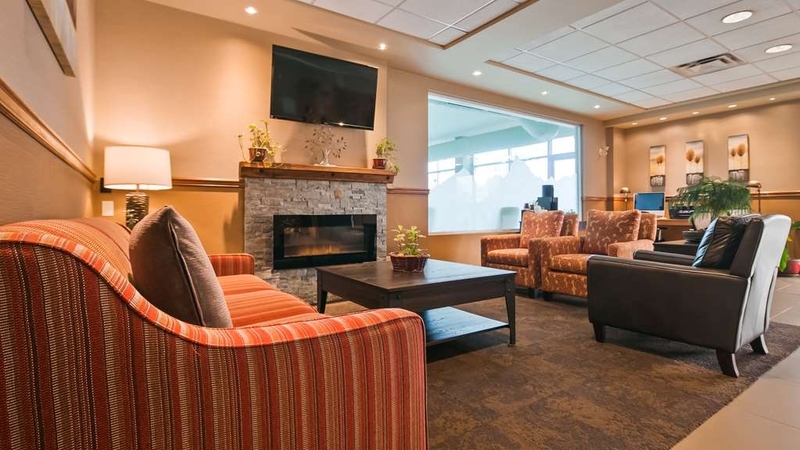 "Good Place to stay in mission bc"
Nice staff, with all the amenities you required for a comfortable stay. Easy approach to city and all locations. 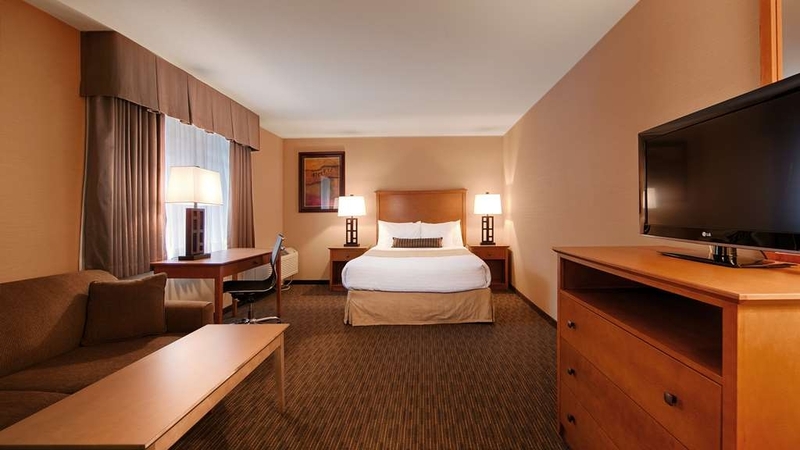 Hotel is on a prominent location and very close to highways. Business people will enjoy at this place. Overall stay at this place is a good value to your money and budget. "Bad Experience with the Front Desk Staff plus dust hanging on the bathroom ceiling light"
Front Desk staff (Cheryl) was very unprofessional and needs to be trained on how to speak to customers particularly a loyal customer (myself being a platinum member). I originally booked for one night but business needed me to stay longer. Thus, I asked that my stay be extended for 3 more nights. The night I asked for an extension of stay, I asked if it is possible because if it is not, I don't mind moving to another BW Plus in Abbotssford. Pam at the Desk informed me that there's no problem at all and she extended my stay. Let me re-iterate, I asked for 3 more nights. Thus, 4 nights in total. On my last day, while I was in away from my room, I received a call from Cheryl, informing me that I should be checking out already. I was surprised and told her that my booking is until Sunday night, so my check out is for Monday morning. She insisted that I should check out already and that they needed my room type for another guest. In a threatening voice she was yelling at me on the phone telling me that my booking is only up to Sat night, check out Sunday. I was appalled by her approached over the phone (very mean and arrogant) and when I told her that, it looks like FD made a mistake in their system for the number of nights that I asked for, her replied was "So, what do you want me to do now? "(repeatedly)--in a very arrogant tone instead of apologizing for the mistake. She also threatened me that she will asked housekeeping to pack all my belongings from the room and take it away, if I don't check out. Very unacceptable! Very traumatizing! How can someone speak to a good paying and loyal customer in that kind of tone is beyond my comprehension. Mind you, I was away on a business mtg when she called me. Now, that was very frustrating and I told her that she can't do that. I asked to speak to the manager only to be told that he's not available. I was frustrated. The entire conversation stressed me out unnecessarily. There's more into this story but I will post it separately. I've never had that very bad experience in any BW hotel and I'll never forget this. It had traumatized me somehow! Due to my frustration, I had the conversation recorded to prove her manner of speaking to me. What unprofessional staff you have at the desk BW Mission! "Clean, Friendly, and delightful Best Western"
This Best Western was exceptionally clean and well run. The uniformed front desk staff were professional, courteous, and very helpful. Our room was well appointed and comfortable. The restaurant was very nice and food (Lunch menu) was 'just right. Hotel amenities were decent, bed was comfortable, the air conditioning in the room was quite loud, they provided nice in room coffee, and overall the experience was fine. Lots of parking, close to the raceway and had a restaurant next door. We didn't get to experience the pool but it looked nice. I have heard that this is the best place to stay in mission and I must imagine that is accurate. The only issue we had was that the wifi was not available in our room (we were the very last room at the end of the hall, so I don't think the signal was strong enough). We stayed in the wheelchair accessible room and it was well laid out for accessibility. The breakfast was good. The gym is far too small and very few options. The hot tub was broken when we stayed there, but the pool was nice (just a bit cold). I was nervous it would be too loud next to the highway and train tracks but we slept very well; in fact, the only thing that woke us in the night is when they slid our bill for "express check-out" under the door at 1am. Friendly staff too! Stayed here many times and look forward to coming back every time. The staff are wonderful, very helpful and make you feel at home. I have never had a problem here and would highly recommend this hotel. "Best Hotel in Mission BC"
Rooms at the along the main highway experience some road and traffic noise however overall a very good hotel. The staff has always been courteous and friendly and professional. Rooms are very clean and amenities are close by with an excellent restaurant on the premises. The breakfast was ok; could use some more fresh fruits. Room was comfortable but the mattresses should be updated. Liked the bathroom, shower and tub. Enjoyed a hot tub after a long day wading. Internet and tv are fine. Will stay again next year. Traffic noise is noticeable as it is right next to the highway. If one wanted to sleep in it would require good ear plugs but as we were getting up early for fishing it was no problem. Good restaurant nearby. This was a comfortable place to stay. It was a positive and enjoyable experience. The place was neat with a fast internet connection and a full kitchen. We enjoyed the swimming pool, fitness room and sauna for a healthy lifestyle as well as free continental breakfast. "Be prepared to eat somewhere else"
We have a group of 8 to 10 rooms that stay here every year for 5 nights. We have always enjoyed staying here as It is clean. Staff are always nice and helpful. Food and service was great. There has been a change of restaurant and serving staff this last trip. Food and service are terrible. After a couple of meals in restaurant and bar we all started eating at other places and having drinks in our room. This was because food is not what we ordered and service is terrible. Restaurant and bar were over staffed in an empty room but still could not get any service. Checked into best western for 2 nights, Friday and Saturday because it was close to where we were going and it was pet friendly. Friday was ok but then Sunday morning at 6am woke up to someone stomping continuously right above us. Once we got up we noticed there were ants everywhere in our room. They were completely filling our puppy's water dish that he had been drinking from. It was disgusting! There were hundreds of them all over the living room/entrance area. They ended up in our shoes and on our bed too. When I was checking out I told the front desk and all the worker said was "thank you for bringing that to our attention". He didn't even offer a discount or an apology. I will never go back. We are extremely unhappy with our experience at the Best western Mission. "My Mission, and I chose to accept it"
On a recent trip to the goal oriented city of Mission, reason being to attend a friend's wedding, my girlfriend and I happened to rest our weary selves at not just the Better Western, but the Best Western. Trust me, fellow travellers, the name boasts no lies. We all know Mission is a land of few words and fewer people, with their raceways, waterways, and Safeways. I myself have only travelled to their prosperous lands a handful of times in my life, but I'm yet to regret any such trip to this day. The staff treated us as old friends, laughing and sharing news of their days and lives, and truly making us feel at home. The room was as quiet as someone who had recently lost their full ability to speak, the remainder of their time on this planet forever spent in silence. The air conditioner made us forget that the sun was currently punishing the populace outside our doors with its tremendous heat, as we cooled ourselves in a Siberian style atmosphere. And finally, the television, while admittedly not purposefully provided by the hotel, was playing a Harry Potter marathon for our viewing enjoyment. Friends, we all know life is short. At any given moment, we could be struck down by a bus or a passing unicyclist with a machete, and not even realize our end was approaching. We must live life to the fullest, and the only way this can happen is if we take full advantage of well priced, comfortable, and convenient lodgings whilst we explore our world. Don't just do it for yourself, don't just do it for your significant other... Do it for what might be, and what might never be. You won't regret it. Went to Mission foe a wedding. Hotel was convenient to the wedding location. Friendly staff and pillows were some of the best we have had in hotels. good breakfast. Was just one night so not much else to say. Good hotel for the area. BrownsSocialHouse is a good restaurant nearby if you choose to eat out. It is within walking distance. Approx 1 mile. Also, Starbucks is across the street. The hotel is older along with the furnishings. But well maintained. I would say this Best Western is good for business travel but not a destination hotel. This is a good best western. Lots of rooms redone. Pool is a decent temperature. Friendly waitress at the restaurant and good service. Comfortable beds with lots of parking. The highway out front is busy but you do not really hear it in the rooms. Our stay was decent at the best western mission. The restaurant was excellent and had a good selection on the menu. The complimentary breakfast was also excellent and a good value which is including in our rate. The only negative thing was upon checkin my credit card was charged a $250.00 dollar deposit to ensure we didn't smoke in our room. I think this is unnecessary as they had my credit card number on file. ""They aren't bed bugs, they are carpet beetles!"" staff like to argue with customers when confronted about finding bugs in your mattress. Then they like to inform the rest of the staff about "the complainers", and also treated like you're a problem. Manager likes to get defensive and "argue" with you for 15 minutes instead of just doing something about it. 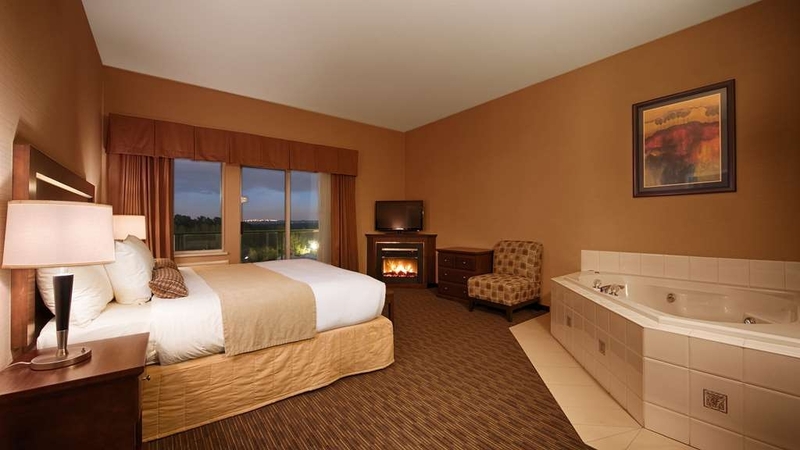 We always look forward to relaxing at Best Western Mission City Lodge after a long day at the race track. Very close to the track and lots of food options nearby. The pool is open till 11:00, we had it all to ourselves and it was very refreshing! The breakfast waffles are fantastic! Staff are very helpful. Rooms are always clean, everything works. The lobby is welcoming and relaxing with computers available for use and daily papers for reading. "Excellent service and quality of hotel"
We were pleasantly surprised at the amazing service at this hotel. The breakfast included was excellent, with eggs, sausages, along with the usual breads, cereal, fruit, juice, etc. The server went out of her way to make sure everything was hot and fresh, and even found me gluten free bread. The bed was super comfortable, although our room was a little small and not well lit. I would highly recommend this hotel if you are in this area. I think this hotel could be great. the room was clean , the staff was good. But I had a kitchenette and for 4 nights they left dirty dishes in my sink. I was told that they would wash them at the end of my stay. I don't do dishes when I pay almost $200 /night. 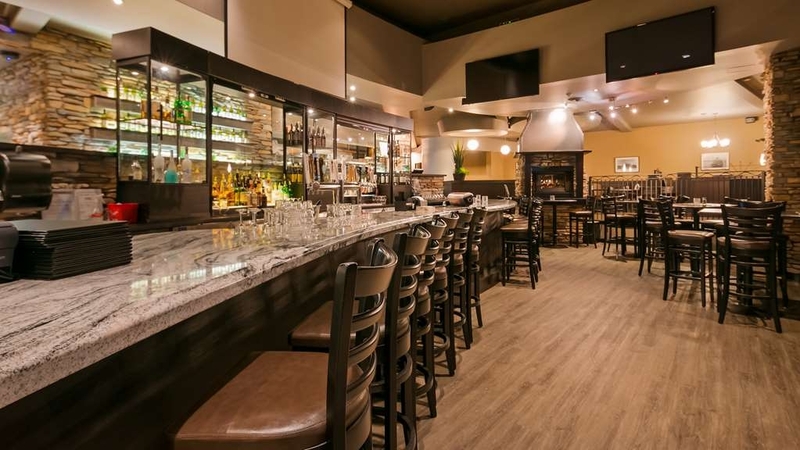 "Lovely location and conveniently has a great restaurant attached." We enjoyed the room, the location of the hotel, the included breakfasts, and also the restaurant attached to the hotel. Would highly recommend staying there. The room was attractive, the bed comfortable, the room clean...everything great! Rooms standard fair; agree with previous reviewer that these are not BW+ that I am accustomed to. With that said, we did sleep well and had nice shower. Check in experience was irritating. I phoned around noon to request an early check in. It was a late request so if not possible I would carry on with my schedule and check in at later time. I was told I could but it would be an hour and 15, she took my number and said she would call me. 2 o'clock and still no word. We were in the area so we stopped in. Told it would be at least another hour. Isn't regular check in at 3?? So forget it and went to Friday nites air show.get a phone call at 8:22 wanting to know if I was still checking in tonite. Of course I am. So not too happy with these desk people. I wasted a good couple hours hanging around area when a " I'm sorry but it's not possible to get an early check in" would have been sufficient instead of stringing me along. And the to phone me at 8:22 to see if I was still coming???? Strike 2. I am a BW rewards member and must say this was the worst checkin experience I have encountered anywhere. We stayed for a week in room 418 (Jacuzzi Suite) for a family of 5. Nice that kids had one room and adults could be in the other. I think I would have preferred solid French doors rather than glass... not good for any real privacy, especially with the Jacuzzi in the master bedroom and the shower not fully enclosed. Honeymooners could easily open solid French doors to have the space... Breakfast bar was standard but got very cramped on the long weekend with an odd entry from outside. We were there in summer, with sun. Could not imagine how cramped it would have been in winter with rain/snow. Great stay at a well maintained hotel with great service. The room was big and comfortable. Breakfast was the usual affair but the staff were much more attentive and helpful than usual. The hotel was easy to find and there was ample parking. "A bit different from the normal BW"
I'm not sure why this BW is rated as a BW+. On this trip so far I have stayed at two BW+ locattions (Kent, WA; Victoria, BC) and I do not consider this motel in the same category. The room was pretty standard but all the warning signs about the motel not being responsible for anything in the room or car was a bit unsettling. I did not find a safe in the room. The atmosphere was decidedly different. "Nice Rooms but Air Conditioners Need Re-Think"
Stayed on 2nd floor. We were welcomed by and awful smell as we got out of the elevator. The smell af the room is not any better. The carpet is very filthy! Some suspicious yellowish colored fingerprints on the door. Be careful if you have allergies. Needs of deep and thorough housekeeping. I'm very disappointed. People in hospitality business should know better. Especially if you're supposed to be in a plus category. 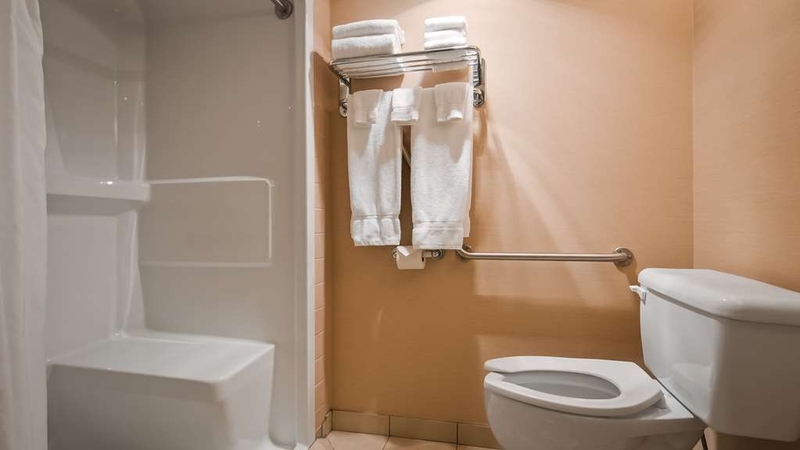 "good hotel in vancouver area"
If you need a hotel in the Mission area this is a great choice. 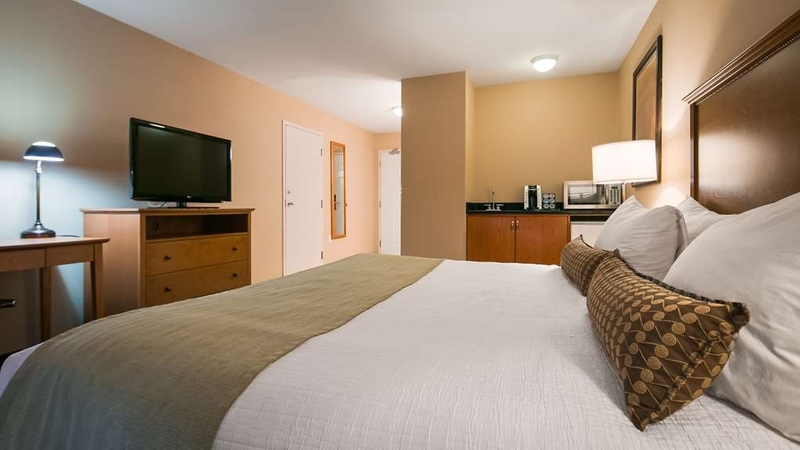 Clean rooms, good breakfast included, lots of parking and you can walk to various restaurants. Good for families as it has a good size pool. Decent property, great staff. Room was good and clean. The property could use a little TLC. Fitness facility is small but functional. Great breakfast, the best free breakfast I've had a hotel like this. 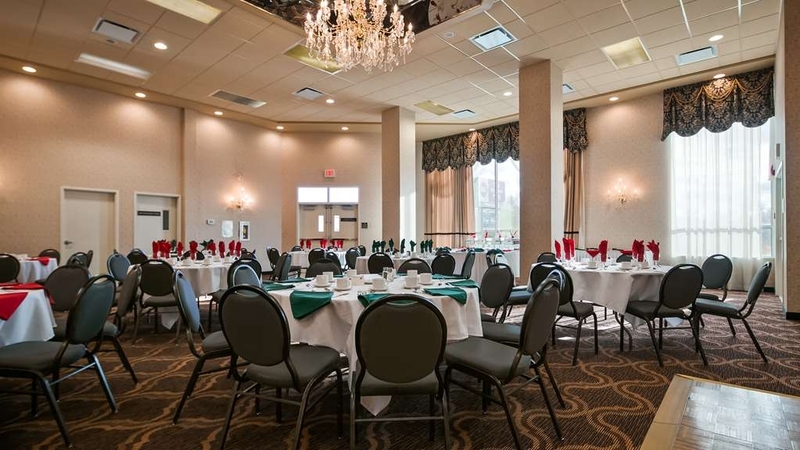 Location is decent for business in Mission and Abbotsford area. "Great Hotel, close to US Border"
Great hotel, lovely facilities and extremely comfortable room. Shower particularly good. Nice breakfast, well presented. Wish we had stayed longer. It was very close to US border so extremely convenient. Best Western is always my first choice. This hotel is just far enough away from Vancouver to suite us. Easy access to everything, shopping, food,and entertainment. We would stay there again without hesitation. This is an area with both city and country to enjoy. "Great stay at ideal location." The staff and reception were extremely kind and very helpful. The location was perfectly located on a major highway but far enough away from the chaos of lower mainland for a peaceful overnight stay. The hotel was clean and had a fresh smell in the rooms. "great vale compared to big hotels"
nice a clean, fast service and check in, complementary internet and breakfast, and free parking too..no surprise prices. Freindly staff, and they always picked up calls for service or wake up in two rings or less. great place and great value! Good service and all amenities are in the vicinity. Restaurant is good quality and surrounding is peaceful for good night's sleep. However, it is about 1 and half hour drive from airport. Good for business or family stay. Thank you, check in is always welcoming and professional. Even if I get in late (2 a.m.). I wish the exercise room and pool was open later though. The breakfast is always treat. The staff are friendly and professional at all time. Very good and helpful staff. Stayed on third floor where we could go straight in to our room from the parking lot. A big help when you are elderly. Room extremely clean and wonderful beds. Our family were able to come to the hotel and swim in the pool. Lovely stay except for the "Pub" food not so good. "The best hotel to stay in Mission, but don't expect too much..."
Check in was OK, although I was a little taken aback with the CAD 250 deposit. Room was OK; however bedsheets and blankets smells musty, which is indicative of mold presence in the room. Checkout was fine; however, I was not given the information on when the CAD 250 refund deposit will be issued unless I asked. 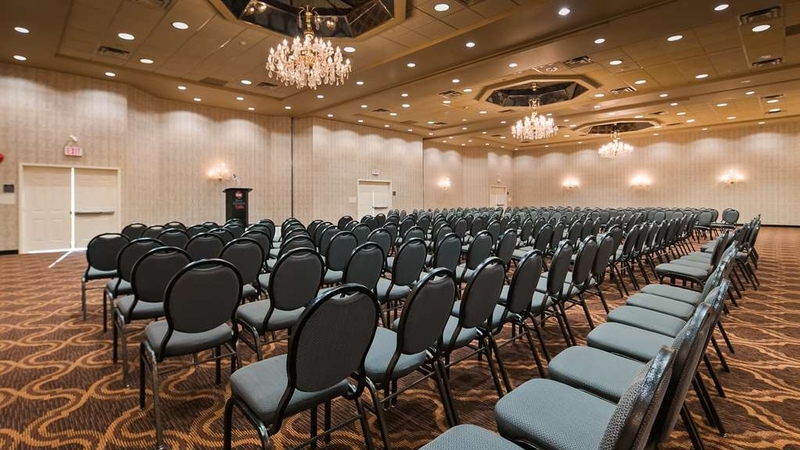 We attended a conference in Mission and stayed 3 nights at the Best Western Mission Lodge. The staff was very courteous and professional. The breakfast was included, but did not change at all. The last day we ate breakfast at Rockos. Overall the rooms were spacious, clean and a very comfortable bed and nice bathroom area. Very nice, clean hotel. The staff were very friendly and helpful. We really enjoyed our stay here. We plan on staying here again as we travel through the area regularly. The location is very central to most amenities. 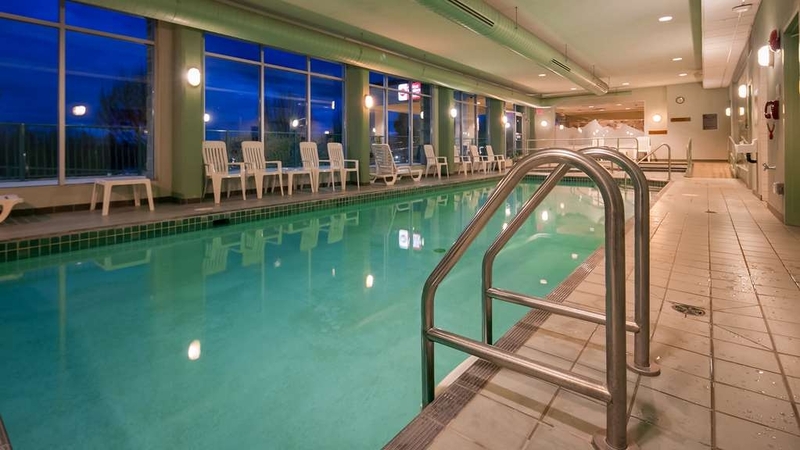 "Great Hotel to Stay At In Fraser Valley / Mission"
This hotel is very clean and comfortable, with pleasant staff, a good breakfast selection, and great pool/hot tub/dry sauna. To Reiterate: This hotel is very clean and comfortable, with pleasant staff, a good breakfast selection, and great pool/hot tub/dry sauna. "Nice Hotel - AVOID Fog on the River Restaurant"
The hotel was nice - staff were friendly and room was clean. However, the restaurant was awful. I ordered butternut squash ravioli. It was $16 and there were 8 pieces of regular sized ravioli. That is $2 per piece. The sauce tasted like ketchup mixed with mayo. There was a small RAW red pepper and onion garnish. The dish was truly awful. Alarm sounded around 1am everybody vacated the hotel. No one from the staff advised the guests of a problem except somebody pulled the alarm but never advised when it was safe to renter the hotel. No other explanation or apology. although this was a business trip the staff was great in service, and the room was well looked after. after the breaks in the meetings the staff looked after the rooms in an awesome fashion, i would defiantly use this location again. Check in was quick & simple. Room was clean and bright. Access to and from highway was easy. Lots of parking. Nice staff. Check out was quick and simple. Lots of great food and shopping options nearby. Some traffic noise, but not unreasonable. Some train noise, but you can tune it out. Friendly staff, rooms are very clean and the staff really cares about your needs. The location is great with a Starbucks right next door and lots of restaurants close by. They have 24 hour security and lots of parking . Look forward to staying here every time. "Good Value and Amazing staff"
Would highly recommend this hotel! 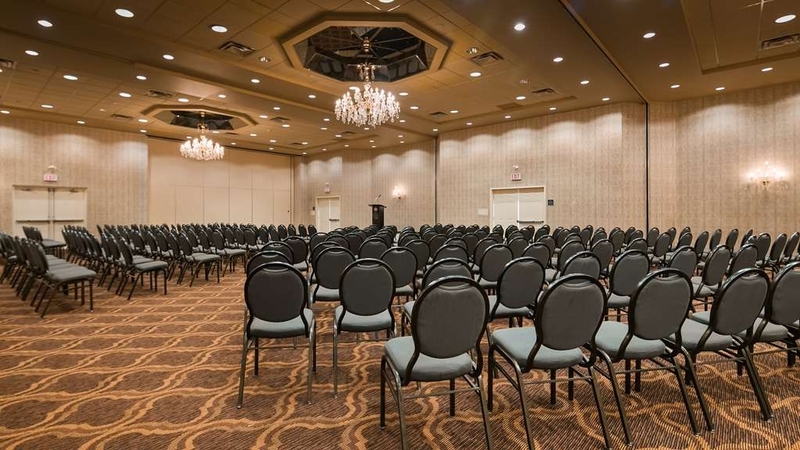 Large,clean well appointed rooms,good amenities and very helpful and extremlely pleasant staff.The location of the hotel was very central and very close to shopping,grocery,liquor and coffee shops. The staff at the hotel were all very friendly. Check in and out was easy and quick. The rooms were clean. The restaurant was affordable and kid friendly and the free breakfast was a great for the whole family!! "Great place to stay when sturgeon fishing!" The hotel is located only minutes away from the boat launch on the Fraser river. Ample parking for truck and boat (as long as there isn't a grumpy film crew taking up space). Rooms were clean and updated. Stay on the third floor as you can park in the back and enter directly onto your floor. Luggage racks would have been nice for packing in gear from a days fishing. If you have your own gear and don't want to leave it in the truck, ask for a room close to the third floor entrance. Fog pub attached has good food. The staff were amazing, very professional and friendly . Great value, definitely will return to this property The breakfast was enjoyable. I would recommend this hotel to other guests without hestitation and look forward to returning. "Good Hotel Out of the City"
The Best Western was very removed from the rush of the hustle and bustle of the city. However, it was clean and staff were friendly. The King bed was very comfortable and the room was large. Lastly the room service servers were polite and kind. I would recommend this hotel for a relaxing stay or lay over before going into Vancouver. 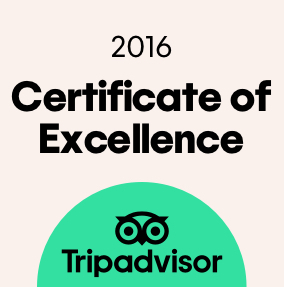 The whole experience was outstanding: staff, room, breakfast - especially the staff they were so friendly and helpful. I will be coming back to this hotel for sure. There were 5 of us in the Jacuzzi Suite and we were impressed by the room. Some work needed to get this old girl up to a standard. Rooms were tired and in need of some renos. Fitness facility only slightly larger than a pair of closets. Attached restaraunt was very good, hope they now work on the rooms. This hotel is on the main road - so a bit of road noise, but easy to get to and excellent staff. THe staff were friendly, courteous and very quick to meet any needs we had. We enjoyed our stay! I would recommend this hotel to friends and family. Close to malls and highway. This hotel is on the main road - so a bit of road noise, but easy to get to and excellent staff. THe staff were friendly, courteous and very quick to meet any needs we had. We enjoyed our stay! I would recommend this hotel to friends and family. Close to malls and highway. Nice room, clean and quiet. Comfortable bed! No issues with the hotel service. We had a room on the front which had a great view. The pool is on the first floor and the attached restaurant can be accessed directly from the hotel which is very convenient especially in bad weather. The staff are friendly and helpful. Would recommend this hotel and would stay there again! 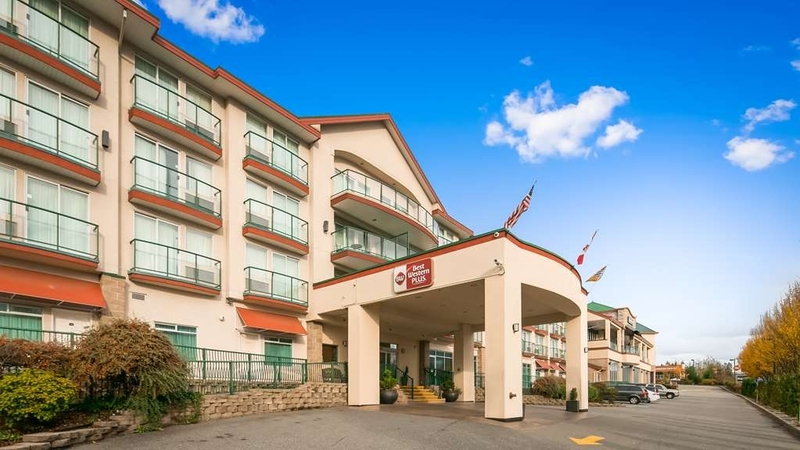 Very nice hotel, with a good location close to everything in the lower mainland. You are about a hour and half from airport and ferry terminals in Vancouver. Close to grocery shopping, and a few restaurants. Our room was a kitchenette and needs a little attention with the kitchen supplies. There was one pot and one spoon and the rest of the utensils need to be checked and updated. Other than that the room was comfortable and clean. The hotel is on the #7 Highway so can be a little loud int he morning but all in all not too bad. Nothing that you don't hear at other hotels. Very quiet at night so sleep was good. You can tell the hotel is well managed, with great care for customers. Room is very clean with thoughtful touches. 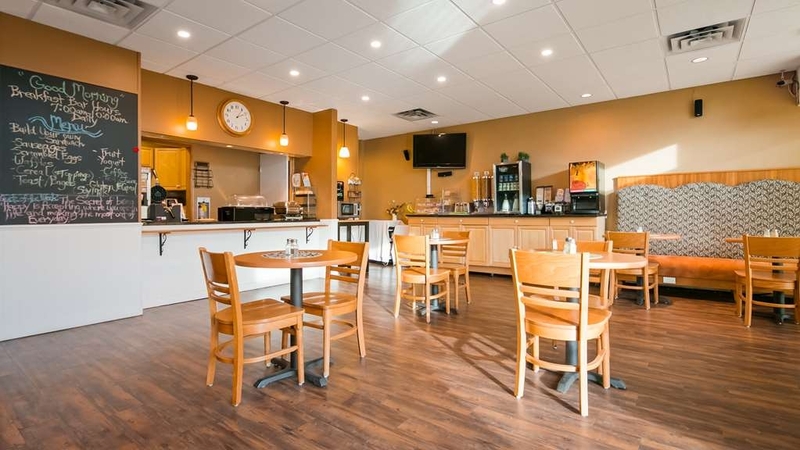 Breakfast takes place at a nicely renovated cafe like room and is very enjoyable with a very happy and friendly lady who helps with the food, and boiling hot water for your tea and oatmeals. Highly recommended. The hotel was clean and the rooms are spacious. Breakfast was awesome and the staff was kind. Our family evacuated for hurricane Matthew. Even though we were far away from the storm our house wasn't. The breakfast ladies turned on the weather channel every morning for us to check for updates. It was the little extra kindness was so appreciated. Stay here! It's close to everything and the staff is wonderful! We stayed here for three nights during our visit to Fraser Valley and Vancouver. The staff were friendly and helpful. Our room was big and comfortable, well equipped. We used the pool and jacuzzi the first night after a long drive. It was wonderful. The breakfast was sufficient and definitely gets you going. We would recommend this hotel and gladly stay again. "Very nice location and amenities "
This was just a quick 1 night stopover, but this is a very nice hotel, the room was well appointed, including an iron, ironing board, in room coffee, comfortable beds and air conditioning. I would highly recommend staying here, especially for the price, breakfast and overall value. "A safe hotel to count on a 5 out of 5 star in all aspects of quality and services"
Just plain easy fun, wonderful pleasant experience. The hotel staff super hosts, cheerful, very helpful, kind, clean. The hotel neat clean great. All other services, personell, hotel, site, inside, outside just fine. The food was fresh clean, sanitary, fresh) on time Had a wonderful fun exprience. Would highly recommmend this hotel to other travellers. Would never sleep here again. The dirt and hair n the corners of the room, under the bed and rugs were disgusting. Leaking under the bathroom sink. Questionable if the bedding was even clean. Watched staff come in to the breakfast bar to load up their plates while the buffet was still on. Everything you could ask. Clean, comfortable rooms with fridge and microwave. Large pool with jacuzzi. Excellent restaurant on site. Good breakfast with lots of choice, impressive waffle machine and chance to sit on sunny terrace. "Very Close to Mission Raceway Park"
Stayed at this hotel for 2 nights solely due its proximity to Mission Raceway Park. Pros -Very short drive to Mission Raceway Park (only a few minutes) -Free parking -Free breakfast (scrambled eggs, sausages, waffles, yoghurt, bagels, bread, pastries, muffins, limited fruit, apple juice, coffee, tea) -Free WiFi - it worked fine -Microwave and fridge in room -Self serve laundry room -Indoor pool and hot tub -Friendly front desk staff -Need room card key to enter hotel's rear entrance Cons -Upon entering our assigned room it did not smell very fresh. -Very unpleasant odour in shower/tub. Spouse thought it was mildew. Shower curtain smelled horrible. -Noisy air conditioner Note: You will hear the race cars if there are races going on. This did not bother me at all but may not be appreciated by some. Everything at this hotel exceeded our expectations and we would not hesitate to stay here again! The beds were super comfortable, pool and hot tub were great, breakfast was delicious and the BEST sausages loved by my entire family. 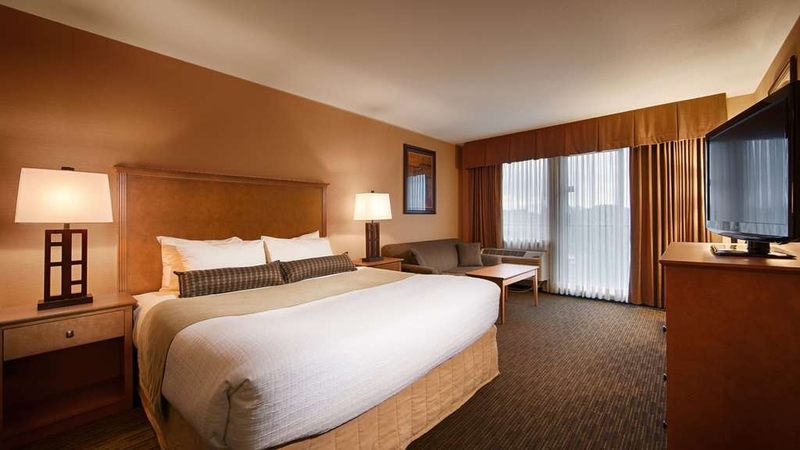 "Clean, comfortable and affordable "
Excellent room! It was very clean and comfortable. The staff were very friendly and accommodating. The room was reasonably priced, given the hotel's proximity to Vancouver. We definitely enjoyed our stay and will return in the near future. Great check-in staff, fair rates, pool and hot tub open until 11pm and a full bar and restaurant in the hotel! Great location to go fishing with the best Mission charter: Lang's Fishing Adventure. Our sturgeon was just shy of 10 feet, and really enjoyed the strong jets in the spa when we got back from the river (less than 10 minutes away). Terrific free breakfast too: Hot eggs, waffles and sausage too. Free parking and great location. Highly recommended for sure! "Great Hotel - Highly Recommended"
This was a very clean hotel, with exceptionally helpfull staff. The rooms were clean and the beds were very comfortable. It was nice to have a restaurant / bar to kick back at and not have to drive anywhere. My family visited the pool area a couple times a day and enjoyed themselves there as well. A convenient office centre where I could print some documents for no extra cost was also apreciated. I highly recommend this facility. "Not much to choose from in Mission"
Although little to choose from in Mission, the Best Western on the Lougheed Hwy., is pretty typical. Average rooms, smallish breakfast buffet. To access the breakfast room, you need to go outside, down a short path, then inside again. "great staff and continental b-fast"
We had a short but sweet hotel stay at this hotel. Rooms were comfortable, spacious and clean. The staff provided great customer service. The rooms had a fridge and a microwave which was very convenient. There are a lot of restaurants, pizza places and grocery stores nearby. The continental breakfast was good as it had a wide variety of options. The hotel says it's open until 10:00 a.m. but they start cleaning up before that so make sure you arrive earlier. We enjoyed our stay. The Front Desk Staff were very accommodating and friendly, very helpful. The Housekeeping Staff were very polite, friendly and also very courteous. 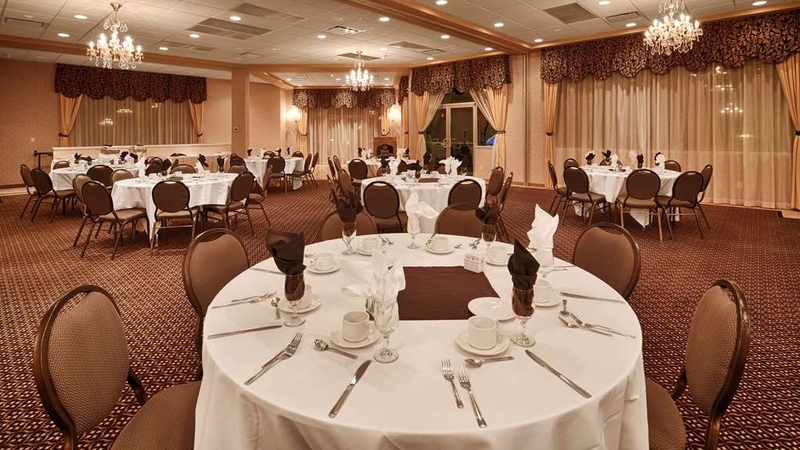 We also enjoyed the Continental breakfast and the Staff were also very nice and friendly. The Hotel was very central for our needs and close to all ameniteis. This hotel faces a very busy 4 lane road, with a loud motor race way behind it on the other side. The noise level in the room 24/7 was too high to sleep. It was especially bad on Fri. and Sat. night do to the drag racing. The hotel was fine except for the noise. Would not stay here, nor recommend. This hotel was a great get way. We had amazing hotel staff they were quick and so very helpful. My children loved having a pool and hot tub at the end of a busy day. We loved the amenities they were so close to our location. It was very quiet location. This hotel is well located, just of the highway. It provides quick access to major highways going to Vancouver. Breakfast center opens early is the morning for a quick bite before moving on with the day. It is just ok. The phone didn't work. The dryer wasn't working. Lobby computer was very slow. Hallways need proper vacuum. Bath tub had paint stain. Breakfast timings are wrong, all best westerns serve weekend from 7-11 but they had 6-10. Rooms are nice and clean. Great value hotel. Nice pool, sauna and hot tub. Delicious hearty breakfast. Nice restaurant on site. 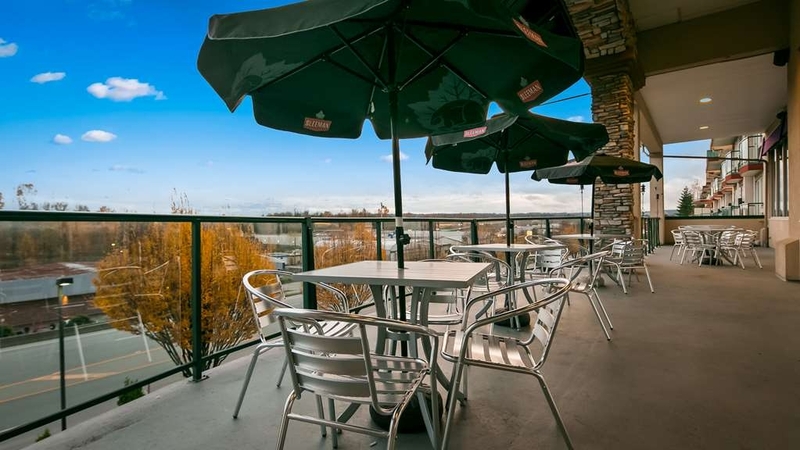 The hotel is right on Lougheed Hwy though, so if you are looking for a great view, this is not the hotel for you! But if you are looking for a good value hotel, somewhere to relax and want to drive somewhere for the day, then stay here. We drove to Jones Lake, and Othello tunnels in hope. We had a great time! "Leisure visit to Abbottsford and Mission B.C." "Its ok The only game in town so...............yeah"
It is what it is. Not much else to choose from around here. 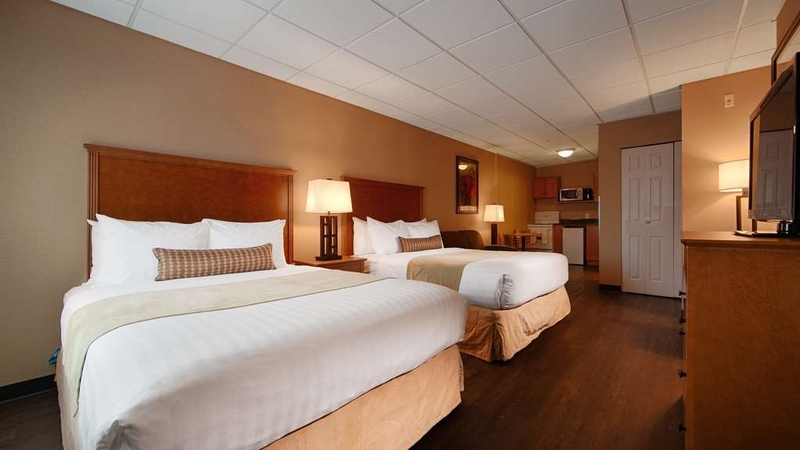 It is pretty clean and probably the norm for Best Western. The restaurant in the hotel is ok too. Not much above the norm here. Same old same old........ Superstore across the street if you need groceries. Lots of other restaurants close. Not sure if they have a pool. 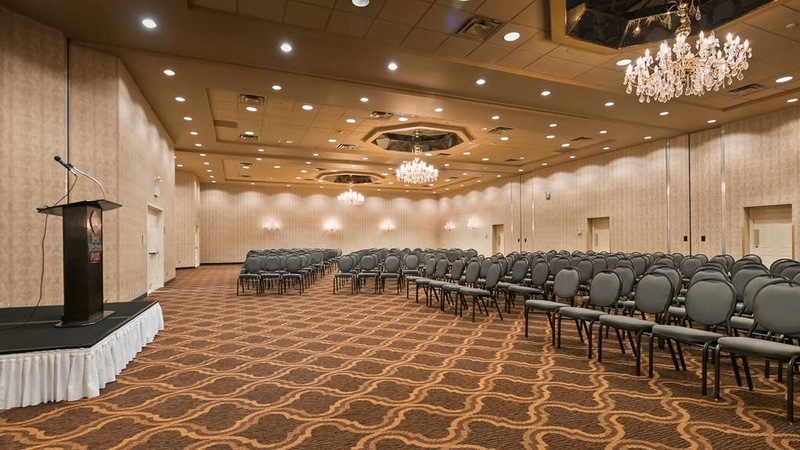 Tried to rent a banquet room here once, was overpriced. Great location for what I needed. The downside was a carpet deodorizer that was used prior to my arrival. The strong flowery smell made my eyes burn... turned the air conditioner on and used some essential oils in peppermint and lavender that helped! Coffee pot was not clean? Room was comfortable though and the breakfast in the morning was a treat! "Mission Best Western PLUS Good Value"
We enjoyed a comfortable and quiet stay at the Mission Best Western PLUS Hotel. We could only stay the one night but would stay here again. 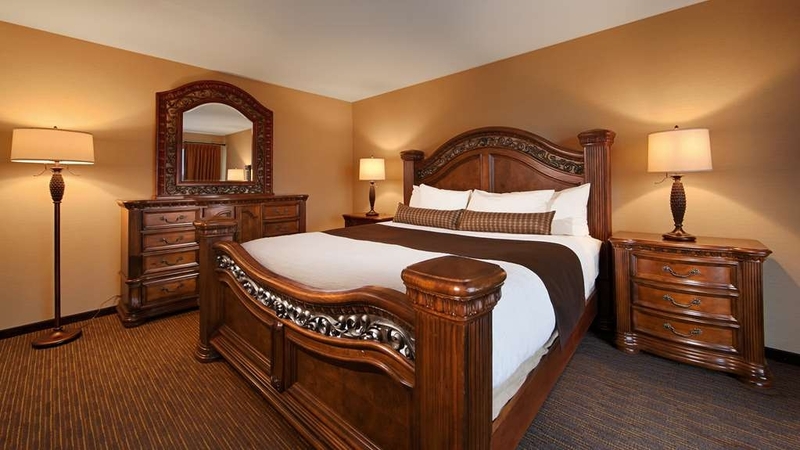 We enjoyed a comfortable and clean room, multiple pillows, good bed, soft and large towels, and a decent array of amenities. 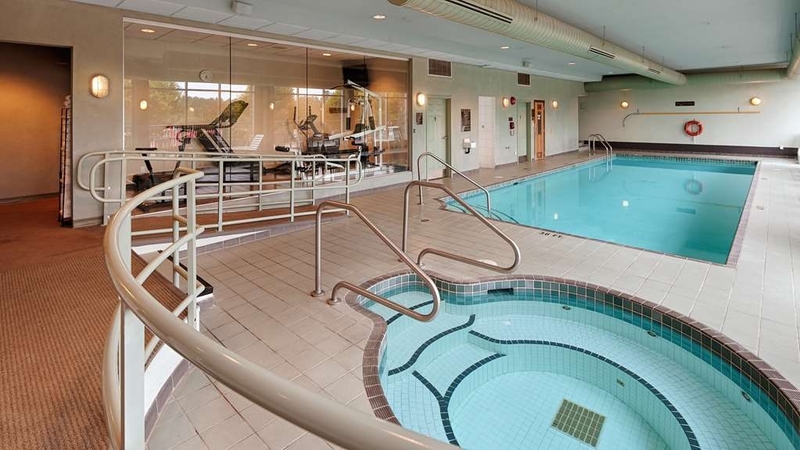 The hotel features a pool and workout room and is good value for the money. We also received a free breakfast with a good variety of food including fruit, yogurt, cereals, breads, waffles, sausages and eggs. We stayed at this hotel recently, under sad circumstances, and the staff made everything much easier for us. They handled mass checkins, they handled sad (dare I say grouchy) people as they arrived for a celebration of life service, and they did it all with a smile. The rooms were exceptionally clean, and nicer than expected - and it's the little things like this that make a difference ! 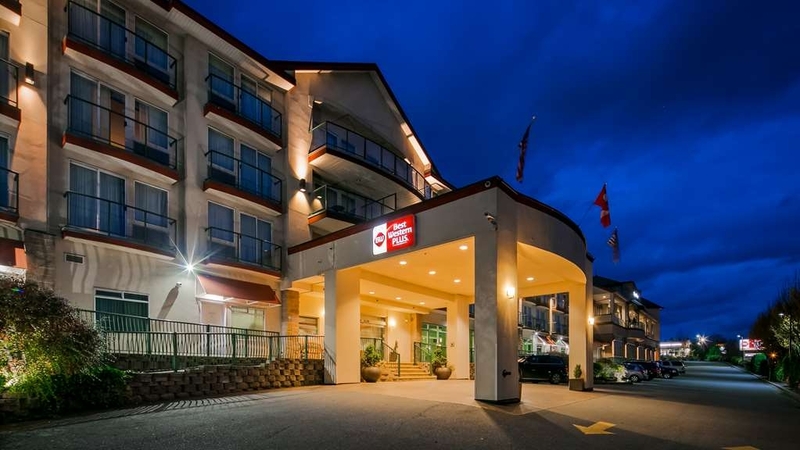 "Pleasant stay in Mission BC"
Visited Mission for 3 nights and stayed at the Best Western Plus Mission location. 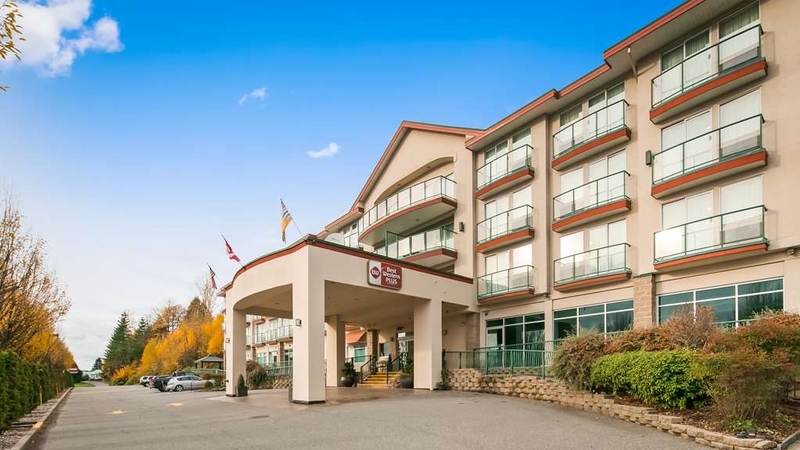 Centrally located to both Chilliwack and Vancouver along Lougheed Highway, making getting around quick and easy, while staying away from the busy Vancouver centre. 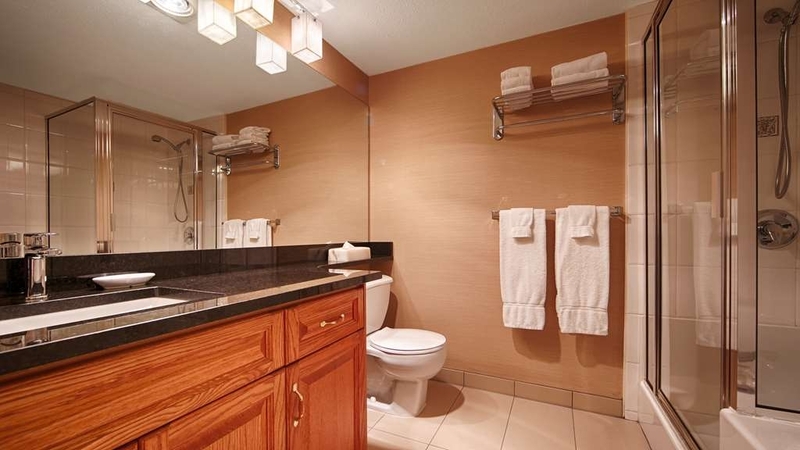 Well situated in the middle of amenities and other services. "The hotel "lost" our camera"
My husband has already written a review about how the hotel "lost" our camera on their facebook page, but I am hoping that if enough people see this we will be able to get our camera back, or at least get the word out about what happened. We forgot our camera at the hotel, it was turned into the front desk given a number, cataloged and placed in the lost and found. This camera is the one that my husband and I used to document everything of our first sons birth. The first weighing, the bath, the delivery, the hospital, everything. The first time he stood up in his crib, and crawled, literally everything. When we went to the front desk the camera had been mysteriously displaced. The t-shirt and flip flops that were found on the same day were still there, cataloged and number, but our camera was no where to be found. After three days of the manager "asking all the staff" if they had seen it or knew where it could be we were told that "either one of your family members picked it up (which none of them did, we asked everyone), or ONE OF THEIR EMPLOYEES took it." then the manager, Mr. Chester Huan, proceeded to tell my husband that he allows the employees to take things, like toys and "things that don't matter", out of the box if they ask, but he would "never let them take something like a camera". Every time that my husband has gone into the hotel to talk to him he has offered to pay for the camera and we have told him time and time again that we don't care about the camera, we can buy a new one we just want the pictures. A police report was filed but the cops couldn't do anything because "there was no proof" and going to the hotel would be pointless because they have a "good relationship". Furthermore, we called their claim line and we were told they could not do anything because we had filed a police report. Ummm sorry, what did you expect us to do when we were getting no cooperation from the management. So I guess all in all we are just disheartened that the place would take something so irreplaceable to us, and even after we came to claim it, not return it. I am not going to say don't stay here, because you probably will, and If I were to be completely honest the rest of our stay was great. I just wish we had not lost the camera. We stayed at this hotel for two nights. It is not a great location if you are on foot and it can be quite noisy depending on which side of the hotel you are on. The room was clean, but we had a broken toilet that kept running. It had to be fixed several times throughout our stay. Though the pool is okay, the fitness centre is minuscule. The staff was very helpful and friendly. Winston, the canine host, was perfect. "Will stay again but a little disapointed ..."
This hotel is upgrading and doing alot of renos. The pub is always good and the lady the runs the breakfast buffet goes above and beyond, A+. As a diamond club member I frequent Best Westerns alot and have stayed here many times. This is the first time I have ever asked to change rooms. I politely indicated that the room I had was not up to BW standards, let alone plus. I was given a new room but nobody asked what the issues were. Very disappointing. Room was not adequately cleaned or inspected. Replacement was good but customer service has slipped a bit. Still the best hotel in Mission but Abbotsford is not that far. We had a great time. Great stay! Great staff. Wonderful stay. Given it was my niece's wedding we were attending and then getting the opportunity to have an early check in made the difference. Very helpful staff. Over and above service. Had the choice to stay in a number of near by Best Western hotels, but we had never been to Mission so decided to go there. The executive rooms are just off the elevator by the noisy ice machine. The room was very large, one chesterfield, desk with steno chair; no chair, no small dining table. The fireplace is electric (no crackling sound) and in the daytime seemed to give a cheap atmosphere but at night gave a wonderful ambiance to the room without adding extra needless heat. There are no instructions anywhere on how to use it so you have to do some searching on the unit to figure out how to turn it on. Bed hard like the floor - my husband who never complains about a hard bed could not sleep on it so that says a lot. Carmen Kanapathy, the manager, said that the beds are to BW's standards. We have stayed at many Best Westerns, some with comfy beds, others just manageable but NEVER one we both could not sleep on. Never have stayed in Abbotsford BW, stayed in Langley and some have complained that their beds are hard but we both were able to sleep on them. Unless you love very hard beds, keep on driving. Our room had a huge balcony with the view of the satellite dish and two cheap plastic chairs - not very inviting. The bathroom has a separate shower and bathtub. Best room in the suite. I was going to privately tell the manager about one of the towels being all ragged but Carmen did not provide an email to write to (just a no-reply email address); so I am not sure if this is one that just slipped through or if rooms other than the executive room receive this standard of towels. This hotel has begun a program of updating. The room was on the front of the building and facing the road and rail track, nevertheless there was minimum noise to disturb our good night's rest. Parking was good ementary breakfast required a trip outside in a cold stormy morning - not too inviting. There was limited choices for the breakfast but it did include waffles and pre-made breakfast sandwich from the 'warming' cabinet and yogourt. The bed was very comfortable and internet access excellent. Some in room maintenance was required and a kettle and drinking glasses were requested since they were not provided as standard. Though the hotel provided a good place to stay it fell short of other Best Western Plus facilities in which we have stayed. Disgusting bedbugs! I had over 60 bites! All the manager would do is offer a two day voucher to stay at his gross hotel! Non transferable and I had to use it within 6 months. DO NOT STAY HERE. Absolutely no concern over my pain and suffering, no offer to help me get clothes that weren't infested. No offer to reimburse me for my prescription medications I had to get! "Bait and Switch with Rooms"
Stay here on occasion by necessity as there aren't many hotels in the area. It's billed as Best Western "Plus" but the rooms are not that great and the ones facing the hill side are small and don't smell great, We asked to be moved but got a lot of attitude from the day manager. As someone who travels a lot for work and play, and is a gold member at other chains, this is very disappointing. The Montreal Best Western "Plus" should be an example to this location. This is a comfortable upmarket motel with a pleasant bar and restaurant, indoor pool and gym. It is situated over the Fraser bridge from highway 1 and has distant views of the Fraser river and Mount Baker. A good place to stopover if tired and approaching Vancouver from the East, or if starting off in the evening going West on 1. The staff on reception are very helpful. The restaurant was a bit quiet at times. We stayed so we could fish the Stave River which has (moderately difficult) public access, about 8 minutes drive away. There is a good "brewpub" in walking distance for beer drinkers. It is on a busy main road, but has good sound insulation. "Pleasant Stay and great service"
We travelled by bicycle and showed up unannounced after a day riding from Vancouver. We received a warm welcome and a nice large comfortable room on the second floor, and our bikes received a secure storage space right in the back of the foyer. The hotel has a restaurant with good food (and good quantities for hungry bicyclists like us). The room was great, with two Queen size beds, which were very comfortable, a large TV and a great shower. They also have free continental breakfast, which was very decent. I also saw a nice sized indoor pool; unfortunately I was too tired to try it out. I definitely recommend staying at this Best Western Plus. We moved from our original room by our request because of what I believe was cigar and cigarette smoke. The room given to us was dusty. The bathroom is worn and dated. The toilet is for small children, it is so low to the ground that you could hurt yourself trying to use it. The tub water spout was not affixed properly and the tub was too small for a bath. No rubber mat was supplied for the tub and made for a very slippery situation when soap rinsed to the bottom of the tub . Overall I was disappointed with the lack of business care for the needs of running a hotel. More care and attention is needed to make a successful business. The lobby looks really nice. The pool was very clean and well maintained. My room smelled stail and smoked in previously. However, I did not mention it or complain. Their was a very clear patch job on the ceiling above my bed. The room was functional and in working order. The place had breakfest included in the rate, but I didn't try it. But with how the breakfest room was setup, you had to go outside and enter another door from the outside. The resturant was good. Just not much on the menu I liked. It appeared to be a local watering hole where people liked to go drink. The checkout girl was top notch and really nice. Is this place my first choice? No. Would I stay again? Yes. Spent 3 nights at the hotel this summer. 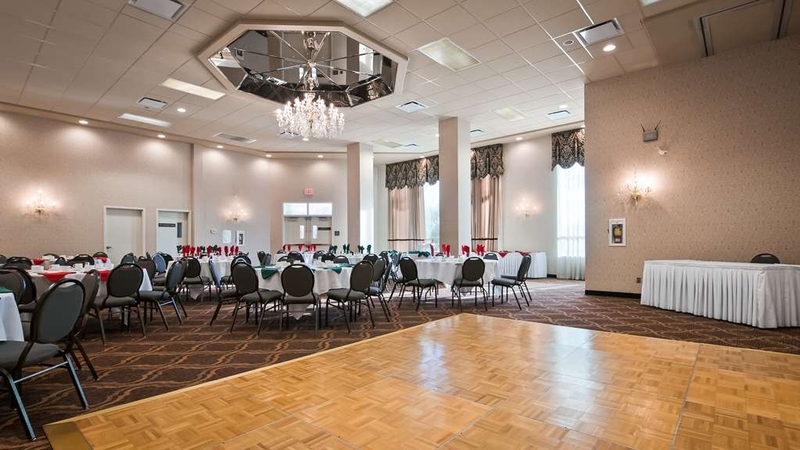 Excellent service, great location and clean spacious room. The restaurant had good food and friendly staff. I would recommend this hotel for business or pleasure. "Affordable and a very nice lodge"
Slept well and had no complaints or issues while our 2 days spent at this Best Western. Front desk staff along with the housekeeping department, were very courteous and informative. Loved the convenient location and the restaurant food was excellent!